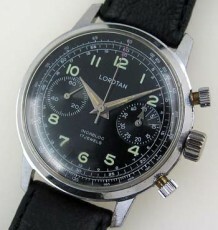 Made in 2006 as a limited run of only 777 examples. Hard to find and highly sought after. The Corum Bubble line of watches has seen its share of hits and misses. In 2006 the Baron Samedi struck the right combination of daring and visual appeal and thus sold out almost instantly. Only 777 units were made and sold worldwide, ensuring you’re not likely to see another in your travels. 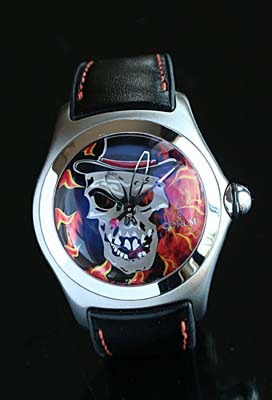 The watch features a flame covered dial with the Baron’s skull painted over top. Aside from the colorful appearance the designers also made teh seconds hands a Voodoo needle. This is presumably because the watch also came in some of the most impressive packaging you are likely to see. A dark black display box is covered in crushed velvet and adorned with a felt Voodoo doll. This Corum Bubble uses a Corum automatic movement and measures 44 across. 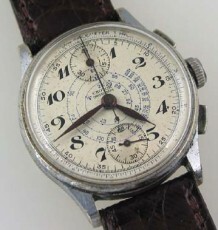 This is the same size as most Panerai watches. 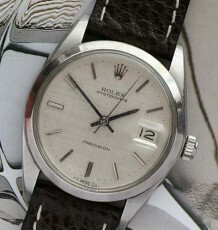 The watch is supplied on a black leather strap with Orange stitching. 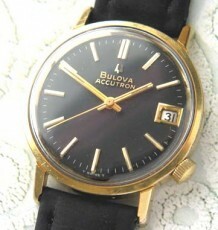 The watch is like new, having only been worn once and comes with all boxes and original papers.